A few years ago, I decided to upgrade my oldies collection to CDs. I probably spent the better part of a year just compiling a list of the songs I wanted to record. This involved figuring out which of the songs I had previously recorded to cassettes that I still liked and buying some of Joel Whitburn's books for more research. Since I already had over 700 songs on cassettes, I had a head start. I found a company in Seattle that would transcribe cassettes to CDs – so I made good use of their services. I still had all my old 45s and albums. I bought an ADS "Instant Music" device to hook up between my stereo and my computer that would allow me to produce .wav files from vinyl. I also had a bunch of commercial CDs that contained some of the songs I wanted to record – I bought a lot more. Sometime during this process I discovered downloading songs from the internet. I made good use of that capability. 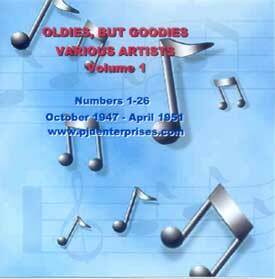 I now have 22 CDs containing 604 songs spanning the years 1947 - 1982. These are recorded, in sequence, by date of peak popularity. I also have an Access database with all these songs on it, as well as artist, dates, original record information, chart position, and the source of the songs. I still have all the .wav files on my hard drive – I can create CDs with any combination of songs, in any sequence. Maybe some day I can figure out how to get my Web site to interact with a database, so you can see all the song titles. The following table contains a summary of these CDs.